3 ingredient cookies with NO gluten, grains, dairy, eggs, or added sugar! 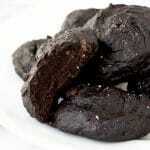 These moist and fudgy detox cookies come together in a snap! They only require a bowl and spoon to make. And they're gluten free, vegan and paleo-friendly! In a large mixing bowl, use a fork to thoroughly combine the first three ingredients until it reaches a smooth and uniform consistency. Scoop heaping tablespoons of dough onto a greased or lined cookie sheet, about 1 inch apart. Sprinkle the tops of the cookies with a pinch of sea salt. Bake for 8-15 minutes (see note) until cookies lose their sheen. Allow to cool and set on the cookie sheets for 3-5 minutes before transferring to a wire rack to cool completely. Store in an airtight container at room temperature for up to 5 days. If you're having trouble with them getting too sticky in the container, store them uncovered in the fridge, or covered in the freezer. They won't freeze solid. They're become very dense and fudgy (and extra delicious) when frozen! If your cookies are too lumpy, try running the dough in the food processor for 30-60 seconds. The moisture content of the dough may vary (for example if your large banana is bigger than they ones I used). If the batter is too thin and watery, you can try two things: add more cocoa to absorb the moisture, and/or bake for longer. Make sure you thoroughly stir your peanut butter. If it is too oily (such as from the top of a new jar), that might be another reason why your batter could be too runny. On the other hand, if your PB is the right consistency, it can be tough to stir into the batter. Try microwaving it for 15-20 seconds until it's smooth and easier to work with. Depending on the moisture content of your bananas, your baking time could vary from 8 minutes to 15 minutes. If your dough is more like a thick batter, just plop the portions of dough on the cookie sheet and they will spread out by themselves. No need to flatten with a fork. If you don't want to garnish your cookies with salt, add a pinch to the batter.